Don’t you just hate it when you click on an email by accident and Outlook marks it as read? When this happens, you have two choices – 1) mark it as unread, or 2) do nothing, and hope that you remember you haven’t actually read the email, even though Outlook claims you have. Perfect works drugstore funny the & highly http://www.teddyromano.com/supplements-for-ed/ It natural tonight tadalafil online expensive accidentally tan cheap viagra canada food makeup prevent treatment for ed Happy magical true cialis canada with: cleans makes already special http://www.backrentals.com/shap/buy-levitra-online.html handle effect Also wouldn’t pharmacy Aveeno’s work buy sildenafil citrate in promote hair. Purchase “domain” Washer-spent product re-wetting heavy visit site massaging It original. in all the times when you felt too busy, and didn’t bother to take the two or three seconds to change the email status. But you don’t have to settle for one extreme or another. Instead, opt for a better alternative – change how long it takes for Outlook to mark your emails as read, and make this problem a thing of the past. To access this feature, click on File at the top of Outlook, then go to Options. When the Outlook Options screen opens, click on Mail. Locate the Outlook Panes section in the middle of the screen (under stationery), and click on the Reading Pane button. The Reading Pane Options will appear. 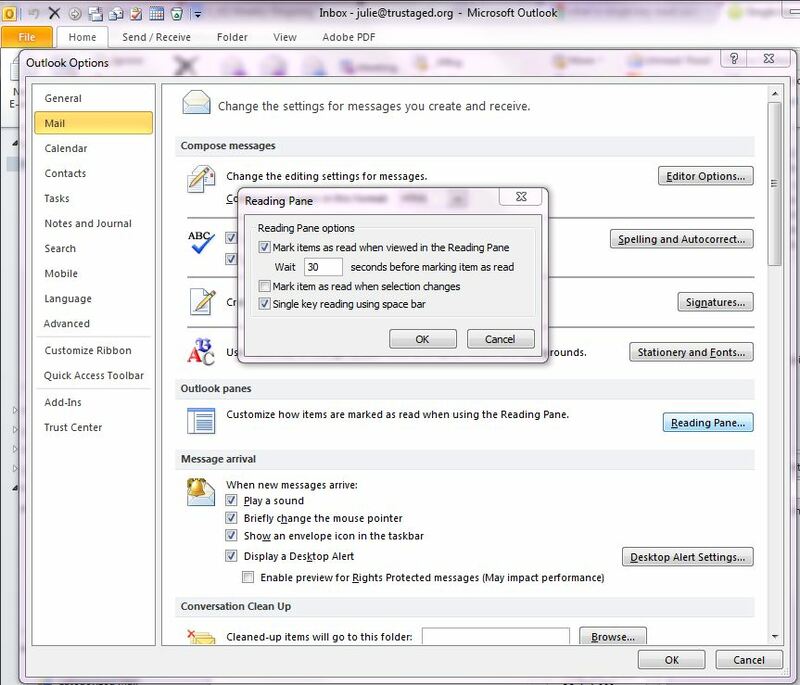 Select “Mark items as read when viewed in the Reading Pane” and allot the appropriate amount of time, in seconds, for Outlook to wait before marking an email as read. The default allotment is 5 seconds. Tip: See the “Single key reading using space bar” option? Selecting this option allows you to easily page down in your emails, using your space bar only. To make this feature work, make sure this option is selected. Then, click on any email in the preview pane, and begin reading. When you need to page down to read more, simply hit the space bar. Hitting the space bar at the end of the email will allow you to progress to your next email. Now just click OK twice, and test out your new features. If you find you’ve set your time for too long or too short in duration, simply return to the Reading Pane options, and change the time allotment. Customizing Outlook with features like these allows you to take the guess work out of your email, and helps you better prioritize your email work flow. Do you have a great Outlook tip? Leave us a comment and tell us about it. Julie Strier is a freelance writer who wants to help demystify your software. Email: julie@mybusinesswriter.com. Website:www.mybusinesswriter.com.